Steenbergs is a delightful company and probably better known for their selection of high-end teas and organic goods. But they offer more drinks than the expected cuppa. It’s summer: ask most people about their favourite memories of this warm season and it’s likely going to revolve around simple things like family days out, picnics in the long grass and reading a good book in a shady garden. Along with those relaxing times there would be ice cream, barbecues, your mum’s Victoria sandwich cake, and some traditional soft drinks. Steenbergs takes me right back to more gentle times with their collection of soft-drink brewing kits by The Old Hamlet Wine and Spice Company. No, these are not brightly coloured powders stuffed with additives that one might add to a jug of water. These are kits for making those much-loved old-fashioned drinks that we enjoyed when we were growing up. I have tried a few of these kits and some do take a while to make, but the wait will be worthwhile. And what a great gift for youngsters who will love the brewing process as much as the eagerly-anticipated end result. This could be a healthy summer holiday project, and many a parent will be looking out for a few of those. Lemon Barley Water just shouts of Wimbledon. Old Hamlet’s lemon barley water ingredients will make up into about 3 litres of concentrate. The additional things you’ll need to make the Lemon Barley Water are 2 lemons, empty bottles, water. It goes a long way when made. Dilute two parts of your freshly-made lemon barley concentrate with one part of lemonade or sparkling mineral water. A classic home-made drink is Ginger Beer. 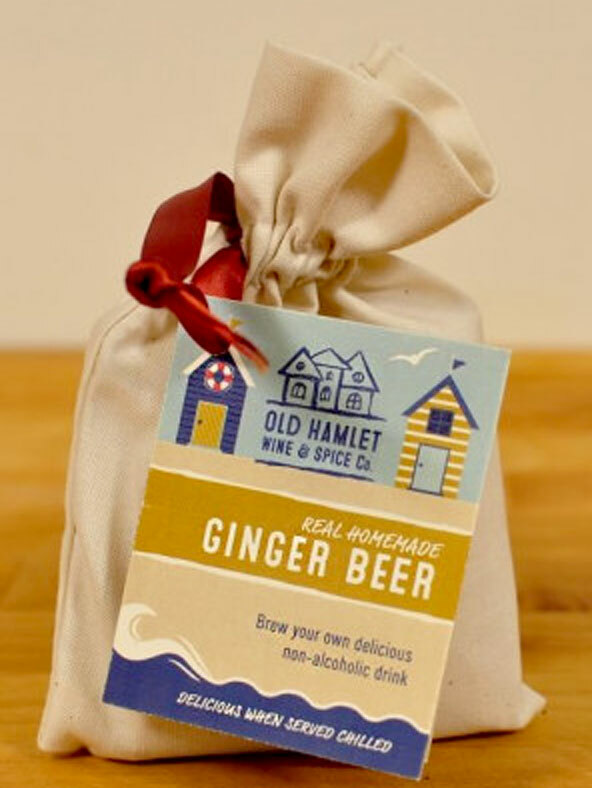 Old Hamlet’s Home Brew Ginger Beer Kit is based on an old family recipe, and it will be ready in about a week. There are full instructions and one only needs to add sugar, lemons and water. Waiting is the hardest part of this process. Old Hamlet’s Elderflower Wine one could describe as having an ‘adult’ taste and it’s quite sophisticated. The mix makes about 4.5 litres of non-alcoholic elderflower wine, but it does take 10 days. This would be wonderful for a summer garden party when alcohol might not be the best choice. These brew kits could make a delightful gift. They are each packed in calico bags which gives the impression of natural ingredients and a bit of class.